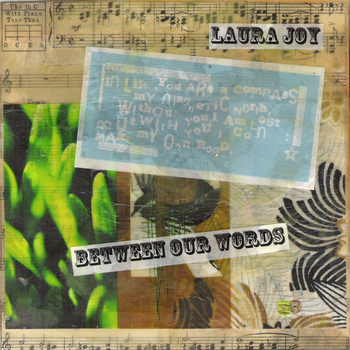 EP REVIEW: Laura Joy, "Between Our Words"
Hailing from the Windy City, singer-songwriter Laura Joy offers up her sophomore effort – a five-song EP, Between Our Words. Low-voltage, lo-fi and warm, this is a fine mixture of acoustic based pop (!) and soothing vocals. For someone who seems to tour on a tireless schedule, this effort is upbeat and emits an embracing vibe. “Takes A While”, the opening track, offers muted/brushed drums, subtle keyboard and nice acoustic guitar with Laura Joy’s vocals not needing any effects to help push across the feel. “Courting Disaster” (a very clever double entendre) has a jaunty near-country feel and “Between Our Words” is a gentle, soulful number with some lovely acoustic flourishes. “Moving On” is the EP’s standout; a quality break-up song with introspectively-wise lyrics (“I feel the ebb and flow of heartache/photographs of you resonate…”) and “Phoenix”, which closes out the set is another highlight and offers a spark of hope in lyrics that describe flight. If this EP is an indication of what Laura Joy can do, then I look forward to what she may offer next – especially in the form of a full-length album. Fine songwriting, a voice that fits the songs perfectly and the right backing accompaniment – the perfect balance.